Our Ribbon Sign Car Magnet is great for promoting health care initiatives and substance abuse programs. 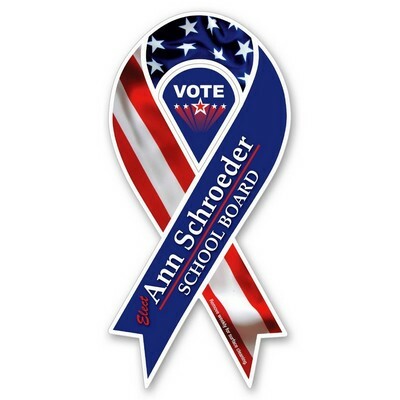 Dimensions: 8" x 3.88 " x .01 "
The Ribbon Sign Car Magnet features a ribbon design that is ideal for promoting health care initiatives and substance abuse programs. They are also great advertising tools during an election year. The magnet does a wonderful job of getting your business name across to every car owner in the country. The phrase "Remove weekly for surface cleaning." is automatically added to every car sign. Please apply to a clean-waxed and dry surface, leaving no air pockets between the sign and the vehicle. Keep the magnet away from repainted surfaces and hoods; remove weekly for surface cleaning, and always before entering a car wash, to prolong its lifespan. Emblazon your company’s logo on these magnets and rev up brand awareness, at upcoming marketing events.